Summer has ended and every one’s hot summer day is turning to a cold winter’s night. Summer is everybody’s favorite time of year with that blazing heat that makes it nice to go for a big splash in your swimming pool. As the winter fast approaches, winter sports begin to take place. One of those sports is your favorite summer activity, swimming! Swim tryouts took place on Nov. 30 and Dec. 1. Coach Julie Margolis said that the team gained 16 new swimmers this year. Hannah Millen, a junior and three sport athlete, is excited to try out swimming as a fun alternative to basketball this year. Millen also says that the older and more experienced swimmers will definitely have a great impact on her. 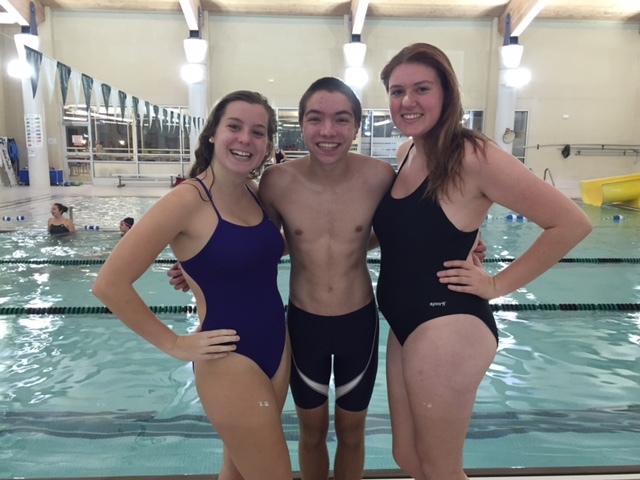 Some of those older and more experienced swimmers include seniors Ryan Sugrue and Sarah Margolis. With many new personal records broken last year, both seniors have been anticipating the new season to hopefully improve and make many more memories before their last swim meet of their high school careers comes upon them. Sugrue says that one of his favorite parts of being on the swim team is how everyone supports each other. Sugrue also says that swimming is a great way to stay in shape while having fun, and that after a stressful day at school it’s a nice way to just unwind at practice. Both seniors have been preparing for college and to leave the high school swim meets behind, but Margolis plans on continuing to swim through her college experience as well. The team wants to succeed throughout their season and Margolis added that she is “hoping to improve the numbers of the team for the future after I graduate, to create a good, competitive reputation for the team at Rockland High. She also said that she hopes to qualify for MIAA Sectionals this year. The swim team’s practices are held at the Hanover YMCA Monday through Thursday from 8-9:30 p.m. The swim team will have its first meet on Dec. 18 at the Scituate Racquet Club against Cohasset. They will compete in the Middleboro Invitational on Dec. 28 during the holiday break.